Here are two programs from one of the world’s most influential contemporary spiritual teachers, now available in digital audio. In "Part One: Finding and Exploring your Spiritual Path", Ram Dass speaks from the heart, with wisdom gained from a lifetime spent on the path to enlightenment, about the often rocky yet profoundly transforming road to living the spiritual life. With personal anecdotes and commentary, he illuminates a wide variety of ancient and contemporary philosophies, drawing from such sources as the Buddha, Russian philosopher Gurdjieff, Mahatma Ghandi, and many others. Here is down-to-earth advice for those on the path to spiritual fulfillment, including the pleasures and pitfalls you will encounter en route, the value and potential dangers of teachers and gurus, and the importance of following your intuitive heart. In "Part Two: Journey of Awakening", Ram Dass focuses on the moments crucial to the serious seeker of the spiritual path. Meditation is an essential part of that practice. Why meditate? To live in the moment. To dwell in the harmony of things. To awaken. Those moments in your life when there is an openness, a spacious quality to your existence—those are the moments that truly make life remarkable. Better than any spiritual guide ive ever read. This book will jolt your thinking so much so that you will be transformed into a more loving, peaceful being. thank you Ram Dass! Easy to slip into and understand... comfortable listening and learning. So helpful in finding peace and calm in my life. I always go to Ram Dass books when I need to settle myself down and find a quiet in my life. love his voice and the book! i wish it was longer. Its only 3.5hours I believe. but listening to him is worth buying..
What did you like best about A Spiritual Journey? What did you like least? I got about 1/3 of the way though... It was good in the sense of message, but it wasn't really a book... It was more of something you would find on YouTube. Wasn't much of a story, more like an edited compilation of Ram Dass speaking his life ideas and experiences into his personal recorder. Would you be willing to try another one of Ram Dass’s performances? 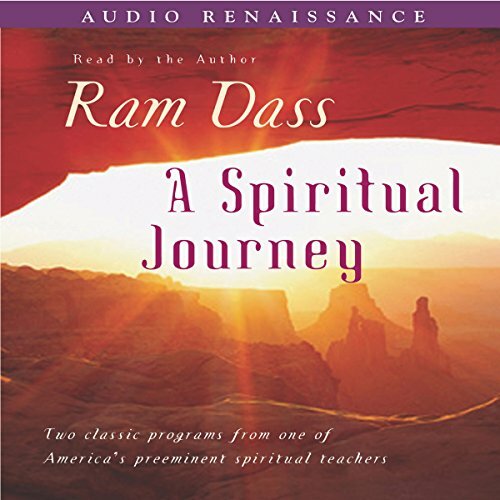 So glad it was narrated by Ram Dass himself... Something about his voice made it real easy to listen to. Enjoyed it immensely! If you are just commencing on your spiritual path. Give this a listen. It will help you understand what you are living. Would you listen to A Spiritual Journey again? Why? Yes, I learned so much from it and would listen to it again and again. What was one of the most memorable moments of A Spiritual Journey? I can't quote it verbatim but it resonated so much when he said we should pick up whatever good we can from all the different teachings for our own personal liberation and from there move on and not be too attached to any group/teacher/faith. This has been my philosophy for a long time. I have a deep suspicion that my Mom who left her body several years ago is now the one guiding me in spirit, and eventually leading me to the writings of Ram Dass. He is very informative, clear and very gentle with his advice and explanations, nothing is forced down your throat. He is a real guru and I pray to God that he will stay will us for a long, long time for there are still millions of lives to be touched. Have you listened to any of Ram Dass’s other performances before? How does this one compare? Yes, they are both outstanding but when he speaks to a live audience, it is doubly enlightening and entertaining especially when he tells jokes and laughs. It is just so endearing. Yes, I couldn't put my ipod down!!! As I said before, spread his message and I wish you would add more books to your collection.